1. A spoken communication with two or more people; a conversation: In the school play there was a dialogue between the two main characters in the first scene. 2. An interchange and discussion of ideas: In Abraham's classroom, there was a dialogue among the students and their teacher about the use of cell phones, or mobile phones, during class. 3. 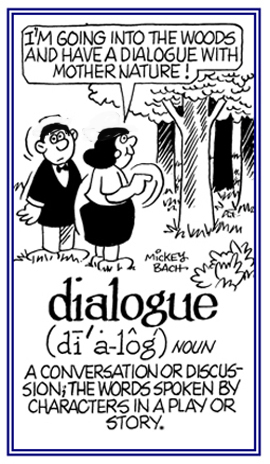 Etymology: "a literary work consisting of a conversation between two or more people"; from Old French dialoge, which came from Latin dialogus, from Greek dialogos, "conversation, dialogue" and is related to dialogesthai "to converse"; from dia-, "across" + legein, "to speak". The meaning of the word expanded to "a conversation" in about 1400. The mistaken belief that it only means "conversation between two people" comes from the confusion of dia- and the similar prefix di-, "two, double, twice" that came from Greek di- and dis-, "twice" which is related to duo, "two". The separation of impurities by mechanical elimination from the blood during kidney failure. So fine and translucent in texture as to be transparent: A diaphanous material or article allows light to pass through so that objects behind it can be easily seen. © ALL rights are reserved. 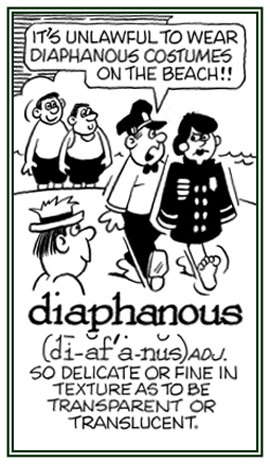 Relating to, of the nature of, or referring to, a diaphragm. Points of contact between bone that allow for ease of movement or articulation: Steve's anatomy instructor explained that a ball and socket joint; such as, the shoulder, is an example of diarthrosis. To prepare for oneself, to revise, to edit; from Greek and Modern Latin dia-, "across, through" and skeuaein, "to prepare, to make ready, to furnish with something". A word for "editor", which comes from Greek, "to make ready" plus "implement"; therefore, someone who makes a revision or who is an editor; a reviser. 1. The dispersion or spreading of something that was originally localized (as a people or language or culture); the dispersion of a people from their original homeland. 3. The dispersion of the Jews outside Israel; from the destruction of the temple in Jerusalem in 587-86 BC when they were exiled to Babylonia up to the present time. 4. The body of Jews (or Jewish communities) outside Palestine or modern Israel. 5. Coined 1876 from Greek diaspora, from diaspeirein "to scatter about, to disperse", from dia- "about, across" + speirein, "to scatter". Originally in Deuteronomy of the Old Testament Bible; chapter 28, verse 25: "The Lord shall cause thee to be smitten before thine enemies: thou shalt go out one way against them, and flee seven ways before them: and shalt be removed into all the kingdoms of the earth."